Lyon is THE destination for foodies. Crucible for top international chefs, Lyon has a lively eating and drinking scene which continues into a post-restaurant-closing hours scene when the restaurant staff enjoy their own eating and drinking. As well as rich Lyonnaise cooking, this city is rich in culture, with plenty of history to uncover, art to experience, treasures to purchase, and even civilised strolling to be done. The Hotel Guru's selection of the best places to stay in Lyon has something for everyone from the budget bolthole to the truly luxurious city pad with Michelin starred cuisine. 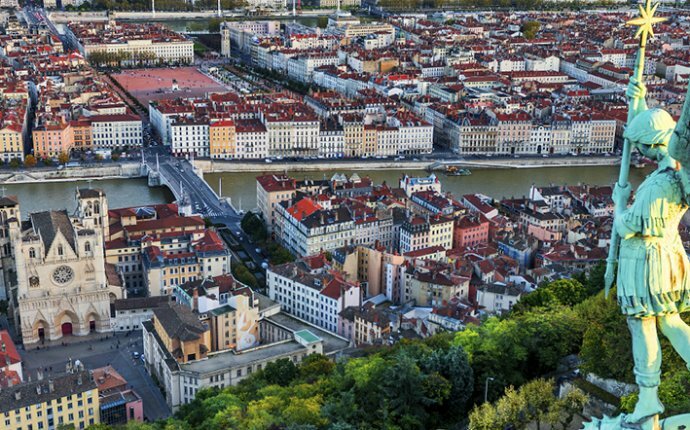 Lyon's stylish centre sits between the Rhône and Saône rivers, an elegant web of boulevards built in the 19th Century, on which you'll find cafes and boutiques. Despite Lyon's reputation as a commercial and industrial powerhouse, its position between two rivers allows for plenty of opportunities for scenic strolling. The towpath along the Rhône's left bank is especially nice. If your idea of perfect French civility involves mature gentlemen playing petanque and boating lakes, then this is the promenade for you. Unlike other cities, the oldest part of town isn't at the heart of the modern city - the cobbled alleys of the medieval Old Town is on the Saône's west bank. This is a slightly quirkier area, and if you're looking for something unusual then this area, and especially the Rue de Boeuf, is the place to come. The Old Town is also full of restaurants. The really ancient bit of Lyon, the Roman bit - Lyon was once the Roman capital of Gaul - is best reached using the funicular from Vieux Lyon metro station. The highlights are the Roman ruins: there are two theatres here, capable of seating 13, 000 people, and the Gallo-Roman museum. Lyon's other great museums are the Musée des Beaux-Arts - which houses works by Renoir, Degas, Monet, Pissarro and Cezanne; The Musée Lumiere - where cinema began; the Musée des Confluences - an ambitious science and technology museum; and the WWII museum. While Lyon's collection of art, historical treasures and architecture are certainly impressive, this city is really famous for its food. There's one stretch of riverside which just seems to be food market after food market. Les Halles de Lyon Paul Bocuse, Lyon's purpose-built wholesale market, is a great place to start if you're here on a culinary pilgrimage. Bursting with specialist stalls and local producers with hundreds of years of experience, this covered market is full of goodies. Treated like a giant pick and mix by the locals, who you'll find eating at the stand up tables, there are also some fancier options here if you want to sit down and be served. But don't worry, Lyon has plenty of enticing ways to keep you sated and more. The bouchons, a sort of cross between a pub and a bistro, are great places to try the amazing local stews and sausages. They vary in decor and sophistication, but bear in mind that some of them have Michelin stars… Of course you'll also find fine examples of the latest international culinary trends here. In fact many of them were probably started here. The 'newest' part of Lyon - because of redevelopment - is the Confluence. This is another good spot for restaurants and is best reached by ferry. Mostly because the views of the petanque parks and the city's architectural peaks are charming.